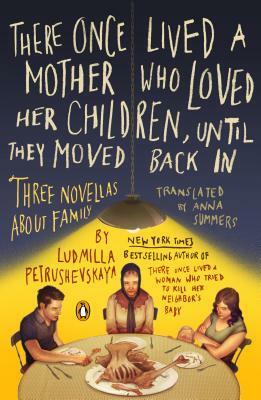 There Once Lived a Mother Who Loved Her Children, Until They Moved Back In is a set of three novellas about family, written by Russian author Ludmilla Petrushevskaya. These are stories of the everyday lives of women who are dealing with many adversities in post-Soviet Russia. In addition to the struggles they face in the society in which they live, these women also deal with husbands and children who treat them poorly in many ways. The Time is Night is the first novella and it takes up more than half of the book. It's about a woman named Anna who is caring for her daughter's child, has a mother who is about to lose her bed at a hospital and may end up back at home, and has a son who has just been released from prison. This story was a bit confusing to follow, but it all made sense in the end. This was my first taste of Petrushevskaya's writing style, and it is a bit shocking in terms of the language she uses and the actions of her characters, most of whom are not nice people. Chocolates With Liquor is about a young nurse named Leila and her horrible marriage. It was inspired by Edgar Allan Poe’s “The Cask of Amontillado.” In this short novella, Leila deals with a husband who is abusive, mentally ill, and trying to kill her and her children. This was my favorite of the three novellas as it was a suspenseful story, albeit quite bizarre at the same time. Among Friends is the final novella. It is about a group of friends who meet every Friday night over many years. The friends' relationships change over time, marriages fail, new relationships emerge. This one gets more into the politics of the time, the fear of informants and the profound impact friends can have on one another. Yet again, the story is bleak and depressing, yet something draws the reader in and it's hard to put it down until the shocking end. These are the types of stories I feel that I need to read over and over in order to appreciate them more. Each time I came to the end, I wanted to go back and re-read to see how we got there. The language is harsh, yet real. It's certainly not for everyone, but if you're looking for something different, try There Once Lived a Mother Who Loved Her Children, Until They Moved Back In. It will give you a glimpse into the dark world of post-Soviet Russia and the horrifying realities in which some families live. This review was written based on a copy of There Once Lived a Mother Who Loved Her Children, Until They Moved Back In that I received from the publisher in exchange for an honest review.